A demo for Owlboy, the much talked-about 2D platformer from Norwegian indies D-Pad Studio, is now available for PC -- a good sign for a game beset my development trouble, despite winning a visual design award at the 2010 Independent Games Festival. 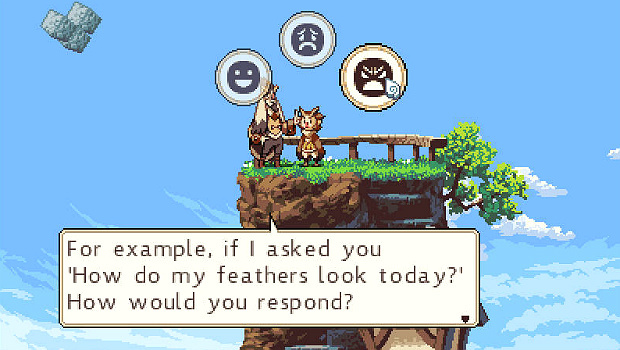 In a sea of slick indie platformers, a few minutes with Owlboy is enough to mark it as a gem -- Otus, the game's avian protagonist, is a joy to control and D-Pad's vision is well-realized, complemented by a handful of savvy design choices and a diet-RPG inventory and upgrade system. And if a boy that's also an owl isn't enough to win your heart, keep in mind that this is the studio responsible for Vikings on Trampolines. In any case, take some time to play through the 80 mb demo, found here, and we'll reconvene tomorrow for some longform thoughts.